A prominent family in Panama has been laundering drug money through his businesses, according to the US authorities. Businessman Nidal Waked and his father Abdul are accused of running an organisation that laundered money through a luxury mall, a bank and duty-free shops. It said it had designated Mr Waked, 36, as a drug lord, describing him as "one of the world's most significant drug money launderers and criminal facilitators". A statement by the US Treasury said the money-laundering operation run by Nidal Waked and family members "uses trade-based money laundering schemes, such as false commercial invoicing; bulk cash smuggling; and other money laundering methods, to launder drug proceeds on behalf of multiple international drug traffickers and their organizations". The family runs Panama's oldest newspaper, the Estrella de Panama, and led a consortium that took control of the duty-free zone at Panama International Airport in 2007. The Treasury's move saw 68 companies linked to the family having their assets frozen, and being prevented from dealing with US companies. 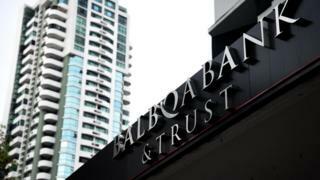 Among those blacklisted is the Panama-based Balboa Bank, that Reuters reported has more than $44m (£30m) in capital and 172 employees.